The 2019 Lutheran East Auction will be on Saturday, April 13th. This year's event will be held at The Western Reserve Historical Society. It will be a great night of food, drinks and fellowship as we raise money for the great work being done at Lutheran East. For more information, please contact Joe Gray at jeg@clhsa.org . 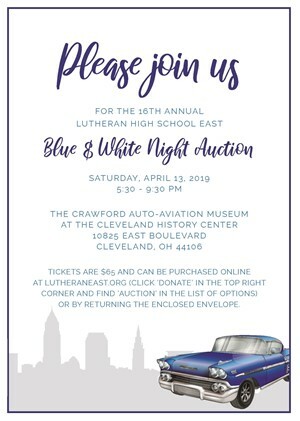 For more information about the Auction, Lutheran East Development, or Alumni functions, please contact Vice Principal of Enrollment and Development, Andrew Prusinski at aprusinski@lutheraneast.org or by phone at 216-382-6100.